Once Again Nut Butter Sunflower Seed Butter is and made by roasting organically grown sunflower seeds. The seeds are milled smooth to create a delicious sunflower seed butter. At first glace, sunflower butter may just look like highfalutin peanut butter, but this butter, free of the top 8 allergen concerns, has a subtle, even flavor profile that lets it act as an accent, not the star, of many dishes, meaning it can transition from lunchtime sandwiches to elegant dinners with ease and panache. Since sunflower butter is made from roasted sunflower seeds, it still delivers with notes of nuttiness intermingling with the classic taste of ballpark-hawking, summer-spitting sunflower seeds. Sunflower butter, like most nut butters, is full of protein and healthy fat. It's also rich with B-vitamins, Vitamin E, iron, fiber, and zinc. 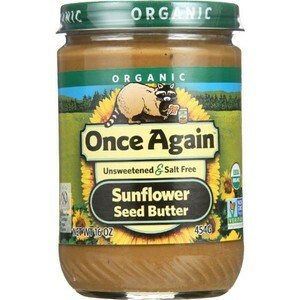 Once Again's sunflower butter is made simply, just "pure sunflower goodness!" meant to be enjoyed morning, noon, or night.